Offers DC fans nuggets of greatness, yet fails to deliver on its iconic source material. As I’ve gotten older, I found my ability to connect with Superman waning. The story of an all-powerful Jesus-like figure who must always escalate to greater and greater challenges can be very entertaining, but there reaches a point when the entire works desperately needs a refresh. Ever since DC Comics first introduced the death, and subsequent resurrection, of Superman in the early 90s fans have delighted in the mind-boggling possibilities such an exciting setup could offer both fans – and the beloved character. 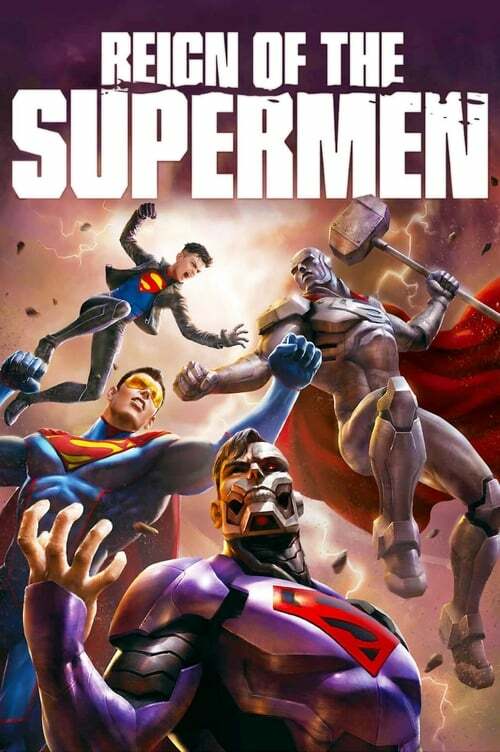 However, Reign of the Supermen, the latest addition to DC’s prolific Warner Bros. animated features, fails to capture the emotion and essence of what that potential could be. There are some great elements of the movie. An all-star cast voices the various Supermen (Superboy, Steel, Eradicator, Cyborg Superman), all displaying various aspects of the original Superman (Jerry O’Connell) minus one key element (maturity; naturally immense power; benevolence; and duty to others, respectively), which further helps us understand how Superman operates. I enjoyed the elevated status of Lois Lane (Rebecca Romijn) as the protagonist, who displayed her tenacity for truth. I also liked Superboy’s (Cameron Monaghan) role as a media star, focusing more on his likes and his popularity than on training and becoming a true hero, especially as a corporate shill for LexCorp. Finally, the post-credits scene made for a nice preview of what’s to come for the DC heroes reboot, incorporating more of the complex relationships between so-called heroes and so-called villains. The trouble that I had with this movie was in the choices unique to the storytelling. From the beginning, there was only an understanding of the impact of Superman’s death, but the film should have started with the iconic battle with Doomsday. Such a setup could show not only the death of Superman, but also its impact across the world and among the other members of the Justice League. As an audience, we are expected to come into the story with the gravitas of the world’s greatest hero suddenly torn away, but without it, the movie starts at a low point. This also comes into play with the conversation between Lois and Wonder Woman (Rosario Dawson) – whose real name, Diana, is never uttered. It’s heavily implied there’s a love triangle between the two ladies and Superman, but there was no setup in the movie that made me feel the awkwardness. There was only a cue that I should feel awkward. Strange hesitation in the animation. There were times where the characters would stop and stare at each other, as if the animation was slowed down to extend the film’s runtime. It may not be the reason, but the stilted motion is jarring. Plot contrivances with Lex Luthor. How he came to have a Mother Box or tap into Darkseid’s systems, I have no idea. Useless characters. Why was Hawkman there? He had no lines and minimal action. Why have him? His presence was distracting. No sense of urgency or loss. There were several examples of catastrophe or near-catastrophe that didn’t receive the attention or care that would be expected. For example, Lex was going to kill his cloned “son”, something that was partly his own flesh, and I didn’t feel the dread from Superboy. The Justice League was wiped away from the planet in an instance, and the world didn’t seem to feel the sense of loss for even their own superheroes (Gotham without Batman, Central City without the Flash, and so on). This could have been done with news cutaways or something more useful for the news anchor character to communicate. Also, an entire group of Metropolis citizens were conscripted to join the Cyborg Superman in his quest to defend the city, and they just fell from the sky with only a single woman to mourn her partner. That said, there were still high points within Reign of the Supermen, and diehard fans of Superman, DC heroes, and Warner Bros’ recent animated efforts should enjoy themselves. However, I felt the movie was an unusual mix, both halted by its animation, and rushed by its storytelling. Like many of the other entries within the DC universe, there was a really good story at its core, but I wish there a little more care in bringing the story to life, and that could have made something truly special. Maybe even super. Besu Tadesse Besu writes features that help reconnect with his gaming roots, rediscovering what it means to love in the process. He also enjoys playing music and overthinking most things, like this bio.